Being a mom that is in the kitchen a lot, not only at home but at work too, it is not a surprise that my kids are pretty comfortable in the kitchen. Growing up my mom always had us participate in some way at dinnertime. It started out with something as simple as putting the placemats out, to setting the table, pouring drinks, cleaning up and eventually assisting in the meal making process. She did 95% of the work but we were often asked to stir the sauce, sprinkle the cheese, flip the pancakes, and many other tasks that made us very comfortable in the kitchen. It wasn't until I had my own kids in my own kitchen that I realized how much patience that requires. It would be a heck of a lot easier to stir the sauce myself instead of cleaning up all the extra sauce that managed to get cooked on the stove top from some little hands getting carried away. Remembering how much it influenced me, I had my kids doing things at a very young age. My kids will often ask "Can I do that?" and part of me cringes because I know how important it is that I say "Sure you can!" when really I want to say "Not now - let me just finish this." So many times my kids ask if they can try making something and I have to willingly let them go at it, no matter how much they destroy the kitchen or use up ingredients that I had big plans for. And don't forget the taste testing - wow, my favorite part! After many years of making many interesting and lets say creative recipes, my recently turned 13 year old completely shocked me on Mother's Day. My husband was traveling for work this past Mother's Day and he put my daughter in charge of taking care of mom on this special holiday. Being the over achiever that she is, she started making big plans many days in advance. She arranged for her dad to take her shopping before he went out of town for all of the ingredients she would need to make breakfast as well as some special gifts. The day before Mother's Day she was busy in her room making cards and planning things out. She asked that I sleep in which I gladly agreed to and not come downstairs until she told me to. She set her alarm for 5:30 AM with plans to eat at 8:30 AM (that amazed me in itself). At 6:15 AM I woke up to the smoke alarm going off - that was quite the adrenaline rush! I leaped out of bed and went running past her down the stairs as she was coming up to ask for help. She had never made bacon before which I have to say is not only a total pain to cook, it is not that easy. After we cleared the air from the smoking pan, wiped the tears away and I assured her with several hugs it was no big deal at all, she was back to cooking and I was sent back to bed. I love that she attempted to do it with no help but knew when she needed to ask for help. It was scary for her but I'm glad it didn't discourage her. An hour later, she came up to my room with the most beautiful omelet with spinach, cheese, bacon, tomato and adorned with fresh avocado on the side. It was delicious! And don't forget my coffee accompanied it fixed just the way I like it. I was seriously blown away and that was only the beginning. I was then invited by my boys to come downstairs. The table was set up with beautiful cards from everyone, including my hard working hubby and a beautiful box with thoughtful gifts. There were several delicacies that included mini pancakes on toothpicks with fresh strawberries and cinnamon sugar toasted tortillas rolled up with Nutella and fresh banana. 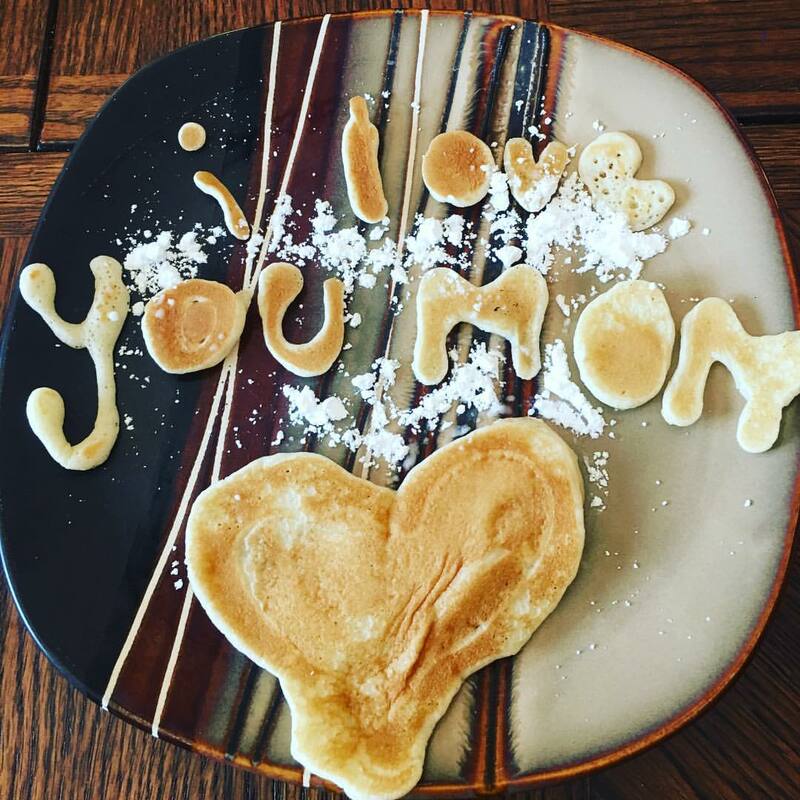 The best part was a plate that read "I Love You Mom" made out of pancakes with a sprinkle of powdered sugar. Seriously people, this was mind blowing! I felt so touched in a way I had never felt before. I don't tell you all this to brag about how awesome my kids are (even though really, they are beyond awesome) but I tell you this to encourage you to let your kids (or grandkids) hang out in the kitchen no matter how annoying it is - it really does pay off. Mother's Day was extra special for me this year. Thanks for letting me brag a little and share with you something I hold so dear to my heart. If the task of cooking with your kids seems too daunting, make sure to bring your kids 8 years and older to one of our Kids in the Kitchen sessions. That is a fabulous way to introduce them to making dinner, trying new dishes you might not normally have at home and learn to be comfortable in the kitchen. Visit our website calendar to see the next available session usually held the first or second Saturday of each month.